I made these one afternoon, around 3:00 pm. By 6:00 am the next morning, there was about 1/3 of the pan remaining. Now, in mine and Ryan's defense, we did both pack some in our lunches for work the next day. Okay, not much defense. We still consumed over half the pan in about twelve hours and twelve hours after that the whole pan was gone! Homemade granola bars are my weakness. I've justified it in my head, telling myself they're soooo much better than chowing down on a dozen cookies. Don't tell me otherwise, I'm just going to keep making and enjoying them. They're at least full of better ingredients than a store bought version, right? Right?!?! 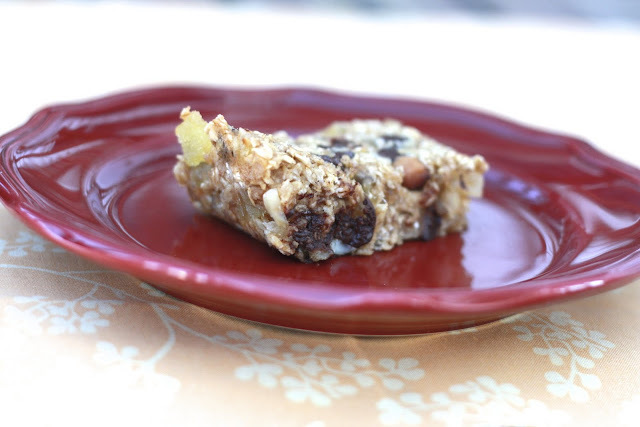 These rival the Mocha Coconut Granola Bars that were my previous homemade bar obsession.Although Joanne's original recipe called for hazelnuts, I was without and instead used macadamia nuts. A brilliant substitution, if I do say so myself. The sweet pineapple, the spicy ginger, and the salty macadamias, all wrapped up with chunks of chocolate is, quite literally, one of my favorite combos to date. These are thick, chewy, and addicting. They also managed to settle the debate. Macadamias are worth the price. I'll be forking over the cash to make these cookies and these granola bars again and again and again! 1. Preheat oven to 325F. Line an 8 x 8 pan with parchment paper or foil. Spray with cooking spray. 2. In a large bowl, combine applesauce, honey, cinnamon, and vanilla, stirring to combine. Stir in oats until fully moistened. 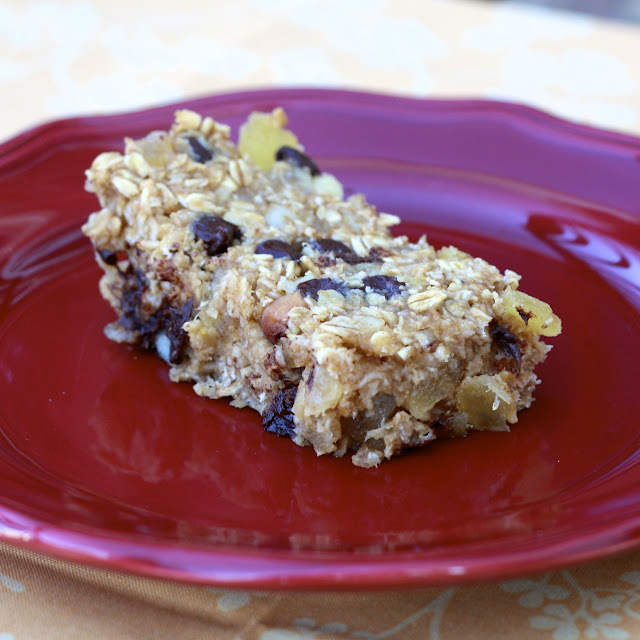 Add nuts, ginger, pineapple, and chocolate chips.